The gorgeous 1970 Simon & Garfunkel song “The Only Living Boy In New York” has a petty origin story: It was written by Paul Simon about his bitter loneliness when his singing partner Art Garfunkel left him in New York to go shoot a movie in Mexico. (Jeez, Simon, maybe just let Garfunkel have that one?) That acrimony isn’t immediately apparent in the song, which soars with wistful melancholy and the duo’s lovely harmonies. The movie The Only Living Boy In New York boldly reclaims the tune for self-pitying young men everywhere—even more so than Garden State, which had the good taste to use the feelings it evokes vaguely and in a single scene, not as a running motif. Marc Webb’s new movie, in contrast, uses the song for its title, the name of an in-movie manuscript, and as a late-breaking song cue that doesn’t drop the needle so much as clunk it down with turgid inevitability. In this movie’s literalized version of a great song, the boy in question is Thomas Webb (Callum Turner), the disaffected young son of an art dealer (Cynthia Nixon) and a publishing scion (Pierce Brosnan). Working at a fancy bookstore somewhere in his 20s (it’s unclear how much school he has managed to finish), Thomas spends a lot of time moping over his feelings for his friend Mimi (Kiersey Clemons), who insists that their one-time tryst will not translate into a real relationship (for one thing, she has a boyfriend). When he discovers his father is having an affair with Johanna (Kate Beckinsale), Thomas reallocates some of that time to stewing over what to do with this terrible secret. He is also befriended by his mysterious and nosy new neighbor W.F. (Jeff Bridges, all mouth movements and glasses-fiddling mannerisms), who provides sage one-on-one counsel—and occasional narration—in a hammy way that briefly raises the question of whether he’s a figment of Thomas’s imagination. The Bridges character is real, but the whole movie is kind of a fantasy—at times a bizarre and off-putting one, at that. Thomas’ romantic tribulations amount to him whining in gussied-up language about getting friend-zoned, and his view of New York is tedious boilerplate about how the gentrified city has lost its soul. Maybe this is intended as a signal of youthful pretension, but W.F. echoes his concerns, and the movie offers no alternative point of view. The screenplay by Allan Loeb (Collateral Beauty, The Space Between Us) has the distinction of affecting that nostalgic world-weariness about the “soulless” state of New York City while also indulging in outdated flights of fancy, like the idea that an Upper West Side family would be aghast at their son’s insistence on living on the Lower East Side, or a theory that today’s media-addled youth have taken their cues from what they learn in art galleries and romantic comedies instead of real life. This is a movie too doddering to even consider blaming society’s ills on the internet. The only thing that connects Living Boy to director Marc Webb’s slick work on (500) Days Of Summer is its sheen of technical proficiency. There is a shimmer of mystery to a wordless scene where Thomas tails his dad’s mistress around town, and a few shots accentuate that feeling by resembling surveillance, observing the characters from a distance. Webb takes some bigger swings, too, like how a drunken and unsolicited wedding toast from a character never seen before or since (at a wedding of two people with no importance to the story) is allowed to sweep into a montage of major characters caught in a rainstorm taking place the next day, intercut with wedding-ceremony reaction shots. This is a grand and pseudo-symphonic gesture. This is also part of an 88-minute movie that barely develops most of those major characters. At the center, Turner puts on the kind of phony “urban” mumble (here nonsensical, given his parents’ more delicate elocution) that so often flags an English actor trying to pass as a New Yorker and/or disguise his Englishness. His fellow U.K. imports Brosnan and Beckinsale are vastly more interesting by the twin virtues of not disguising their voices and fitting so poorly into the sad-faced melodrama this movie wants to be. It’s a simple matter of baseline charisma; one scene between Turner and Beckinsale is marginally more interesting than the others simply because she’s placed closer to the camera during most of it. It’s not hard to pull focus from Thomas, positioned as he is somewhere on a New York coming-of-age spectrum between the mild Tadpole and the loathsome Art Of Getting By—and similarly, inexplicably irresistible to the women in his life. The resulting dissonance isn’t entirely Turner’s fault. He was more likable as recently as a few months ago when he starred in Netflix’s Tramps, a New York-set movie that explores less overexposed city territory, and makes sense of his fake New York accent besides. Webb somehow has him looking like James Franco doing an awkward impression of a poindexter and Loeb has him sounding like cut-rate Woody Allen (the phrase “make love” abounds). 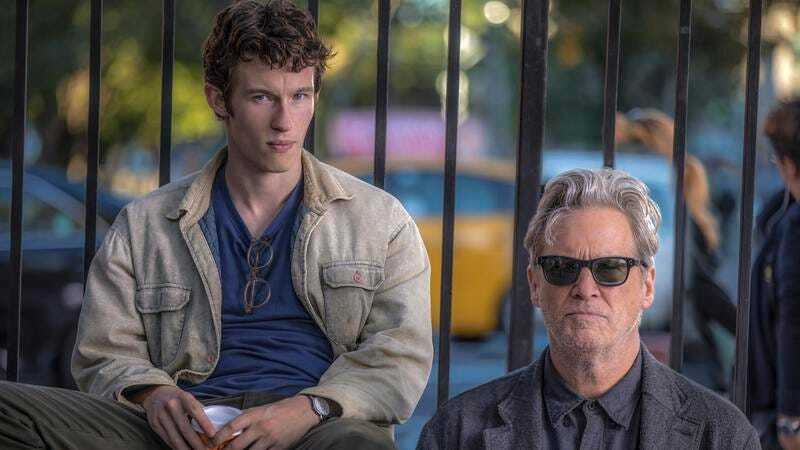 For all of its received wisdom about New York and feelings purloined from Simon & Garfunkel (plus poor Bob Dylan, whose “Visions Of Johanna” turns up for another dumb-as-rocks soundtrack cue), there’s no joy in the endless borrowing of The Only Living Boy In New York. It doesn’t reorder familiar notes into something new; it distinguishes itself by how poorly those notes are played.